Auf meinem Montags-Plan stand, dass ich diese Woche mindestens zwei Blöcke für das Celtic Solstice Top nähen wollte. Was soll ich sagen, ich war im Flow und das Top ist FERTIG! Mit Border und allem drum und dran! Wobei ich echt wieder mal erkannt habe, dass ich nicht gerne Border annähe. Den Medaillon-Quilt streiche ich mal ganz schnell wieder von meiner Wunschliste! On my monday’s plan I wrote, that I wanted to sew at least two blocks for Celtic Solstice this week. So, what can I say, the top is finished! Completely with all three borders! Although I have really realized again that I do not like to sew borders. Insgesamt besteht mein Celtic Solstice nur aus 24 Blöcken und den zweiten Rand habe ich etwas abgeändert (hab kein blau mehr). Das Top ist jetzt ca. 124,5 x 170 cm groß (67″ x 49″) und wird ein Spendenquilt für die Kellerquilter. My top is made of 24 blocks and I changed the second border a little bit (no more blue scraps). Celtic Solstice is approx. 124,5 x 170 cm groß (67″ x 49″) and will be a charity quilt for the Kellerquilter. Schaut bei Bonnie nach, wie viele tolle Celtic Solstice Quilts entstanden sind! Hop on over to Bonnie to see many beautiful Celtic Solstice Quilts! 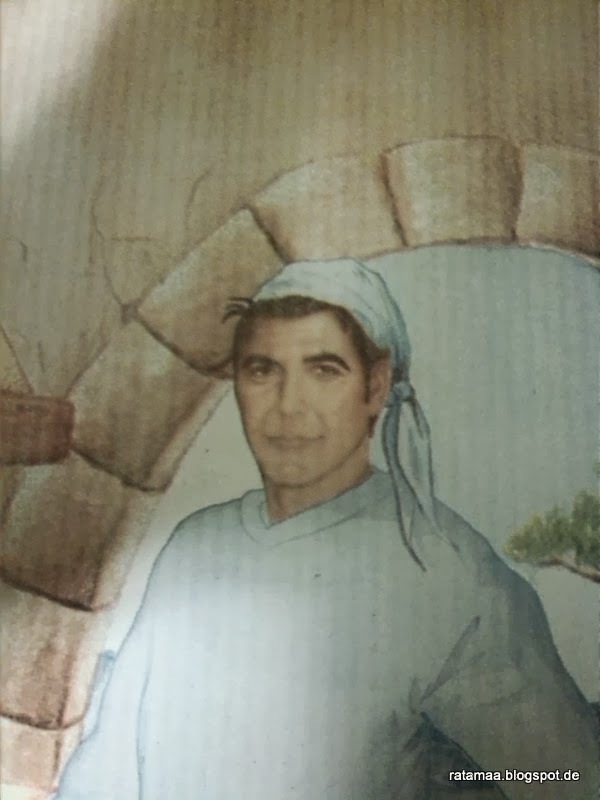 Und was gänzlich außerhalb des Themas: Sehe nur ich auf dieser Pizzaschachtel George Clooney??? 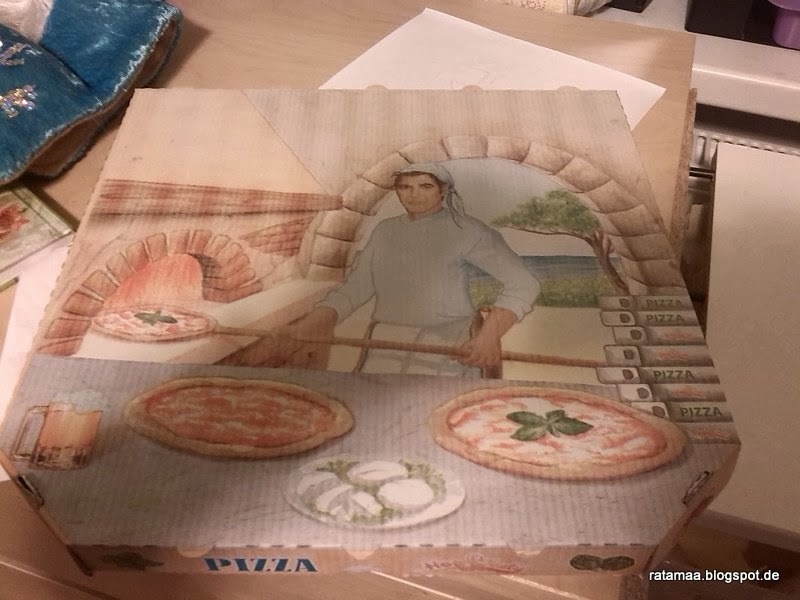 And some off topic: Can only I see George Clooney on this pizza box? 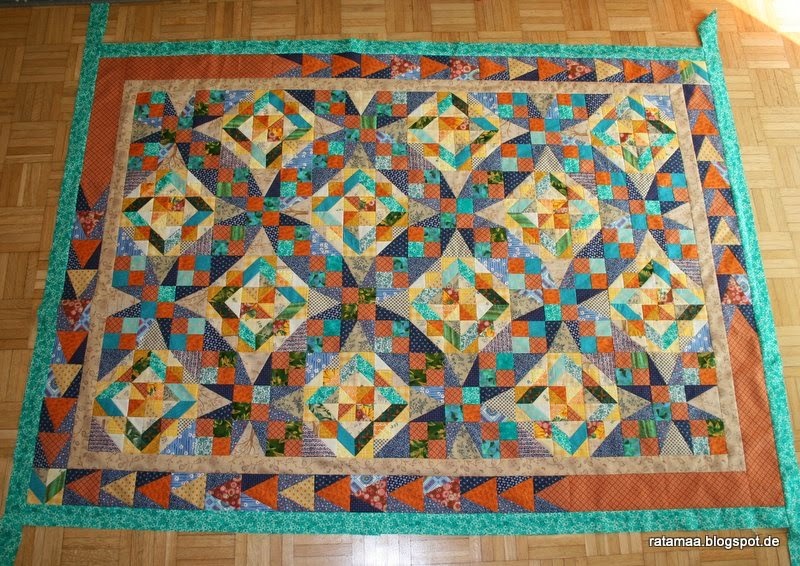 Great job in making a change to the triangle border to make it work with the fabric you had available. That's very striking. Your mini Celtic Solstice looks great, and you fixed the border really neatly. George Clooney? No. I only see Mario der pizzamann! Love the colors of your quilt! Lovely quilt! Your border frames it nicely. It's beautiful! Really like the variation on the border.